This new edition of Reporting for Buyers provides guidance for the surveyor on setting out the findings of the inspection in a　clear, unambiguous and unequivocal way. The book provides a full, critical look at the current situation, describing the various types of report currently available to the public for commissioning. The limitations and attributes of these reports are discussed and their respective forms of advice considered in detail, together with the advice provided to buyers which is a legal requirement to Scotland. The authors stress the need for Surveyors to demonstrate their all-round abilities by putting themselves in their client’s shoes to provide advice appropriate to their needs and requirements. and the RICS Home Buyer Report. 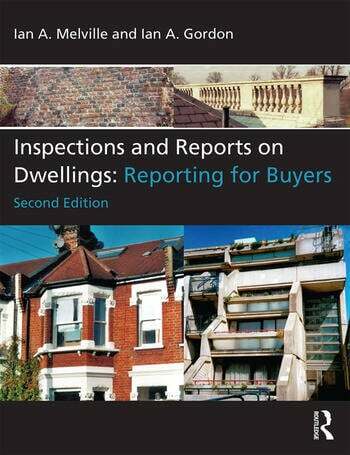 This book is intended for all those engaged in inspecting and reporting on dwellings, whether experienced , newly qualified or studying for appropriate qualifications to become members of professional institutions. It will also be found useful to conveyancing　solicitors acting for lenders. Ian A. Melville FRICS and Ian A. Gordon FRICS have considerable practical experience of inspecting and reporting on dwellings for all purposes and in particular on the diagnosis and repair of defects in dwellings of all ages. They are joint authors of the successful EG Books publications ‘Structural Surveys of Dwellings Houses’ and ‘The Repair and Maintenance of Houses’ together with all four volumes comprising the first edition of ‘Inspections and Reports on Dwellings’. Ian Melville died unexpectedly in 2014.